This is an easy, tasty and healthy side dish. Combine rice and broth in a small saucepan. Bring to a boil over high heat. Cover, reduce heat and simmer until the liquid is absorbed, 12 to 14 minutes. 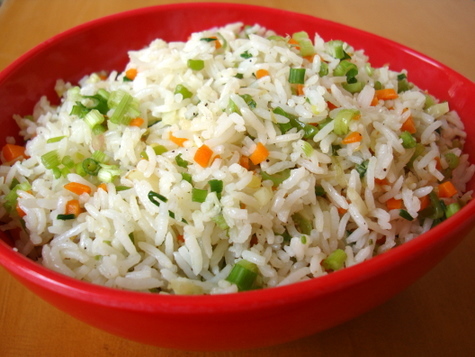 Spread the rice out on a large plate and let stand for 5 minutes. While the rice is cooling, coat a large wok or skillet with cooking spray and place over medium heat. Pour in eggs and cook, stirring gently, until just set, 30 seconds to 1 minute. Transfer to a small bowl. Heat oil in the pan over medium-high; add asparagus and cook, stirring, for 2 minutes. Add bell pepper, scallions, garlic and ginger; cook, stirring, until the vegetables are just tender, about 2 minutes. Add the cooked rice, liquid aminos and vinegar to the pan; cook until the liquid is absorbed, 30 seconds to 1 minute. Fold in the cooked eggs. Remove from the heat; stir in sesame oil and hot sauce. Try it as a side dish or try this: cut 2 chicken breasts into bite-sized pieces, dip them in a mixture of equal parts olive oil and Bragg’s Liquid Aminos, and bake them at 375 degrees for 12 minutes. Add the chicken to this dish once it is cooked for a healthy Chinese food dish! For more recipes and health tips, enter your information below.